The giant cruise line company is using virtual reality technology to help drive interest in taking a cruise. In an effort to drive more interest in taking cruises and perhaps change perceptions of who goes on them, Carnival Corp. (CCL - Get Report) announced a partnership with Samsung and AT&T (T - Get Report) on Thursday to set up virtual reality stations inside 133 of the phone giant's more than 2,200 U.S. retail stores. Visitors to the stores can walk up to the Samsung Gear VR demo booth, put on a headset and be immersed in the sights and sounds of a cruise vacation. The virtual reality content is developed by Carnival, and will highlight decks, staterooms, entertainment venues and other features on board. Excursions shown to smartphone shoppers will include Barcelona, Mexico and other popular destinations for Carnival. Furthermore, if a customer purchases Samsung's GS6, GS6 Edge, GS6 Edge Plis and Note 5 smartphones at one of the 133 AT&T locations during a roughly one-month promotional period, they will be eligible for on-board credit for a future cruise. Customers can get $25 toward a 3-5 day cruise or $100 toward a 6+ day cruise on Carnival's namesake brand, or $100 credits on the company's Holland America and Princess Cruises lines. 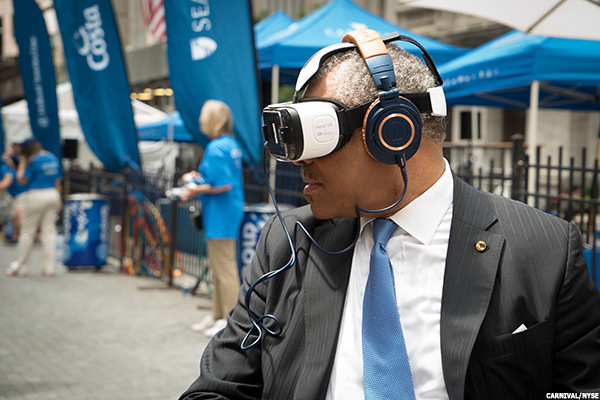 Carnival CEO Arnold Donald goes on a virtual cruise outside of the NYSE. "Globally, the growing popularity of cruising vacations is far outpacing land-based vacations, by a 23% margin," said Arnold Donald, CEO of Carnival Corporation in a statement. Donald added, "With most of the U.S. dealing with winter weather, the timing for this launch is designed to give people a fully immersive look at why cruising is a great vacation - and helps remind them to think about going on a cruise when planning their next vacation." Carnival becomes the second cruise line to embrace virtual reality in the hopes of selling vacations. In April 2015, luxury boutique cruise line Azamara Club Cruises released its own Oculus Rift DK2 headsets and headphones to show off virtual cruises at trade shows and industry events in the U.K. What Carnival has done, however, is more extensive since its efforts take place in retail stores and are aimed at end customers rather than primarily those in the industry. Judging by Carnival's recent results, though, it may not need a lot of help from virtual reality to get people on board its huge ships. The world'a largest cruise line by revenue reported that when excluding the negative impact of the strong U.S. dollar, fourth quarter net revenue yields increased 4.1%, better than its guidance for a 3% gain. For the year, net revenue yields in constant currency improved 3.2%. Net revenue yields are a key cruise industry metric that measure revenues in relation to available capacity. 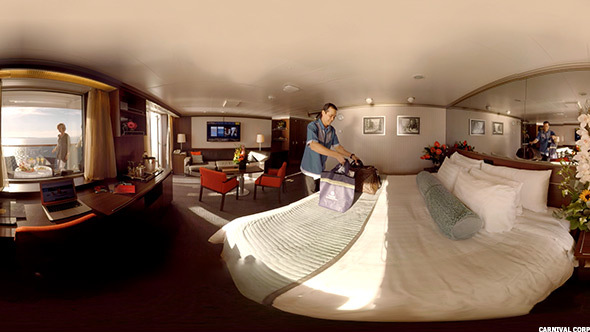 Using virtual reality glasses, one could see the ship's amenities up close and personal. Earnings adjusted for one-time items came in at 50 cents a share for the fourth quarter, up 85% from the prior year as Carnival benefited from lower fuel prices and the improved amenities on its ships that are attracting vacationers. Carnival said that advance bookings for the first three quarters of 2016 were "well ahead" of the prior year, and at slightly higher prices excluding the effects of currency. Shares of Carnival have gained about 5% in the past year, out-performing the S&P 500's 8% decline.